Gardening is a big deal with many families. Not only does it respond to a father's natural desire to help his family be self-sufficient, but it connects us with nature and our natural environment. Whether your garden is an acre or more, or whether it is in a window box, gardening can be a real plus for families. And gardenin﻿﻿g is a great way for dads to spend productive time with their children and to teach them some important concepts. These might include our reliance on nature, the fragile nature of our environment, the "law of the harvest" and the importance of work and personal responsibility. 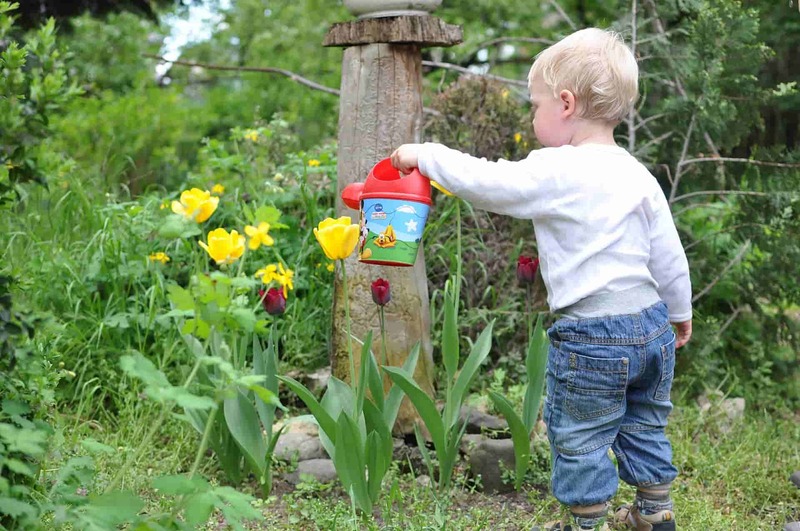 Here are a few ideas for gardening with kids, and helping grow kids in the process. Know Your Soil and Climate. A good garden starts with a careful plan. Answering a few questions about your garden area will help. What about soil? Is your soil sandy or is it more clay? If the soil in your garden area is too dense, it will be hard to succeed with a garden. You will need to take some steps to improve soil quality such as mixing in sand, soil with more loam, or you can create a raised bed garden and import all the good soil you need. How about climate? Does your climate support a long-term or a short-term garden? In some locations, the growing season will be eight months or more. In other locations, you may only have three or four months. You will need to select plants that will germinate and produce within your growing season. What about location? Is the garden spot in full sun, in partial sun or in the shade most of the time? Different garden plants require varying degrees﻿ of sun and shade. Make sure you take these factors into account when planning the garden. Access to water? Do you have access to water and in enough quantities to succeed? If your area is experiencing drought-induced water restrictions, you may need to choose some drought resistant varieties of plants. Create a Plan. Whatever your gardening conditions, you need to start with a plan. Draw a scaled diagram of your garden spot, noting the sun/shade combination for most of the typical day. Understand how your chosen spot will operate. Select Plants. Based on these factors, choose some plants that will work. Make sure if you are growing vegetables, you pick those your family will eat. If you can't handle beets, don't grow them even if they meet your soil conditions. Some of the easier plants to grow in vegetable gardens include tomatoes, squash and carrots. Remember that if you are involving your kids, they want a stake in the outcome. If your growing season is long enough, consider home growing pumpkins for Halloween jack o lanterns. If your children love tomatoes, consider planting a couple of cherry tomato plants. Plan ahead for the outcome to be fun. For many dads, the ONLY value in a vegetable garden is what it teaches kids about values. Let's face it - unless it's in your blood, many dads can think of better things to do with their time than hoeing, weeding and fertilizing. Here are a few recommendations from dads who have successfully used gardening as a great fathering tool. Involve Them at the Beginning. Let the kids be involved in selecting the garden spot, choosing what to plant, and how the garden is divided up. The more involved they are at the outset, the more committed they will be to the garden's success. Divide and Conquer. Several gardening dads recommend dividing the garden into segments and assigning an appropriate segment to each child. They would then be responsible for weeding and cultivating and eventually harvesting their section. It is pretty easy to tell who has worked their section and who hasn't as the summer progresses. And a little peer pressure from the more responsible ones works wonders. Create a Schedule. It is easier to weed and work the garden early in the morning or late in the evening when the weather is a little cooler. Maybe Saturdays at 6:00 a.m. is a good time to devote an hour or so, followed by a family breakfast. Find one time a week when most of you can work together. It will take more time than an hour a week, but at least you have some scheduled together time. Try Paper Cups. A couple of my gardening friends recommended taking a small paper cup and cutting out the bottom and placing the cup over the top of where seeds were planted. Some children have a hard time distinguishing between good plants and weeds-then everything outside the cup is a weed! At least until the plant is grown and recognizable, this is a good approach. Share the Profits. A garden can be a good money making project as well if the children grow and their sell the products from the garden. If you are growing an entrepreneurial garden, let them keep the profits beyond their expenses. Given an economic incentive, kids will often perform well. Go For Sensory Pleasure. This doesn't mean what you think…. It means planting vegetables and flowers in part for their color and texture. Remember that kids need variety in their lives. So put some yellow marigolds around the red tomato plants, or add some squash varieties that have a different texture. Make it fun. Gardening can be great fun for dads and kids, and an opportunity to commune with nature. It can also be a great way to teach responsibility and to bring focus to a child's life. Be a great dad and incorporate gardening into your fathering tool box.